What Are Causes of Shingles? What Are Symptoms and Signs of Shingles? When Should Someone Seek Medical Care for Shingles? Are There Shingles Home Remedies? Is Follow-up Needed After Treatment of Shingles? Is Shingles Prevention Possible? Is There a Shingles Vaccine? Shingles (also termed herpes zoster or zoster) is a disease caused by reactivation of a previous infection with the herpes zoster virus (also named varicella-zoster virus, VZV, HHV-3, or chickenpox virus) that results in a painful localized skin rash, usually with blisters (fluid-filled sacs) on top of reddish skin. Herpes zoster viruses do not cause the sexually transmitted disease genital herpes. That disease is caused by another virus named herpes genitalis (also termed herpes simplex virus, type 2 or HSV-2). The chickenpox virus (varicella-zoster, VZV) may remain in a dormant state in the body after an individual has chickenpox, usually in the roots of nerves (nerve fibers) that control sensation. In about one out of five people previously infected with chickenpox, the virus "wakes up," or reactivates, often many years or decades after a childhood chickenpox infection. When the virus is reactivated and causes shingles, the resulting virus is usually referred to as herpes zoster virus. Researchers do not know what causes this reactivation. What is known is that after reactivation, the virus travels along a sensory nerve into the skin and causes shingles. The term shingles is derived from the Latin and French words for belt or girdle, reflecting the distribution of the rash in usually a single broad band. This band is only on one side of the body in the large majority of people and represents a dermatome -- the area that a single sensory nerve supplies in the skin. The area of nerve pain may occupy part or all of the dermatome (see figure 1 below). The majority of people who get shingles are over the age of 60; it infrequently occurs in younger people and children. Investigators estimate that about 1 million cases of shingles occur per year in the U.S.
Risk factors for shingles are common, and the majority of people have at least one or more risk factors. For example, anyone who has had the chickenpox infection or chickenpox vaccine (live attenuated virus) may carry the herpes zoster virus that causes shingles. Older people (over 50 years of age), those with cancer, HIV, or organ transplant, or people who have a decreased ability to fight off infection due to stress or immune deficiency have a greater chance of getting shingles. However, the newest data suggest that the rate of shingles is increasing in people under 50 because of the chickenpox vaccine. However, the majority of people with shingles or risk factors for shingles are relatively healthy. Most people do not need special tests to be done to see if their immune system is strong and functioning normally. "What does shingles look like?" To answer the question, the following figure shows the lesions forming a band across the patient's left abdomen. 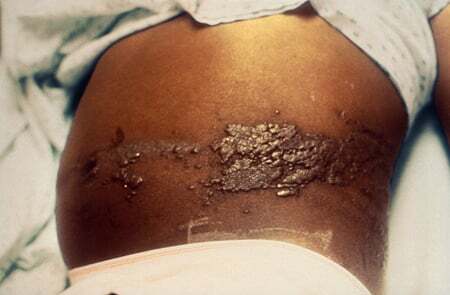 Figure 1: Picture of shingles in a child with leukemia showing a characteristic band of lesions; SOURCE: CDC. Depending on the nerves involved, shingles can affect many parts of the body. The first symptom of shingles is often extreme sensitivity or pain in a broad band on one side of the body (see Figure 1 for an example of dermatomes, areas where individual nerves from the spine function). The sensation can be itching, tingling (oversensitivity or a pins and needles sensation), burning, constant aching, or a deep, severe, shooting, or "lightning bolt" pain. If these symptoms appear on the face, especially near the eyes, seek medical help immediately. Other nonspecific symptoms that can occur at the same time are fever, chills, headache, and itching. Typically, one to three days after the severe pain starts, a rash with raised, red bumps and blisters erupts on the skin in the same distribution as the pain. They become pus-filled (fluid-filled blisters), then form scabs in a few days (about 10-12 days). In a few cases, only the pain is present without the rash or blisters. These painful red blisters and reddish rash follow a dermatomal distribution (a linear distribution that follows the area supplied by one nerve, known as a dermatome); this usually occurs only on one side of the body and does not spread to other body sites in most individuals. The rash disappears as the scabs fall off in the next two to three weeks, and scarring may result. Some people develop a nervous system problem, post-herpetic neuralgia (PHN), in which the localized pain of shingles remains even after the rash is gone. As many as 15% of people with shingles develop postherpetic neuralgia; most of these cases occur in people over 50 years of age. If a person develops pain or a rash in a band on one side of their body, they should seek medical care as soon as possible. Antiviral medications are effective only if given early (24-72 hours after the rash develops). If the rash with blisters is on a person's nose or near the eyes, they should be seen by a health care professional immediately because the virus may spread to the eye and cause eye damage or vision loss (quick follow-up with an ophthalmologist is recommended). 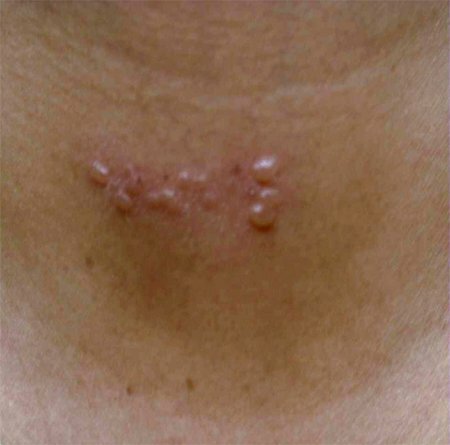 Although the earliest appearance of shingles symptoms is sometimes confused with hives (raised areas of itchy skin), impetigo, bedbug bites, or scabies (skin infection by scabies mite), the classic pain, and blistering in a band on one side of the body may be all that is necessary for a doctor to clinically diagnose herpes zoster infection (shingles). This is the most frequent way shingles is presumptively diagnosed. The rash may occasionally extend outside of this band or, infrequently, to the other side of the body. Rarely, there may be only pain in a dermatome band without a rash. The doctor may decide to do tests to confirm that a patient has shingles. However, these tests listed below are not always necessary, as a presumptive diagnosis based on clinical findings is often definitive enough for diagnosing shingles. A Tzanck smear, which is less commonly performed now since newer diagnostic techniques are available (see below), involves opening a blister and putting fluid and skin cells from it on a glass slide. After using a special stain, the slide is examined under the microscope for characteristic viral changes in the cells. This method is unable to distinguish between VZV and herpes simplex virus (HSV), however. VZV causes shingles and chickenpox. HSV types may cause cold sores or genital herpes. Viral cultures or special antibody tests, such as DFA (direct fluorescent antibody), of the blister may reveal varicella-zoster virus. DFA results are often available within hours. This test differentiates between VZV and HSV viral types. Viral cultures may take up to two weeks or more to yield results. 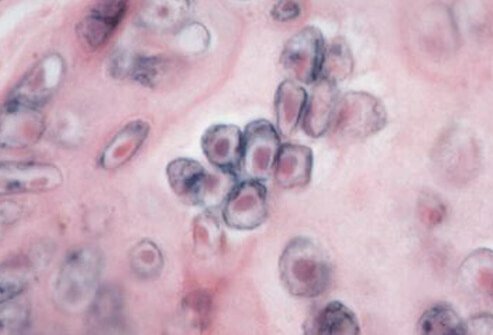 Skin biopsy, taking a piece of skin rash and looking at it under the microscope, is another possible way to diagnose herpes zoster. A culture of the biopsied tissue may be done if there are no intact blisters to culture. Also, viral DNA (deoxyribonucleic acid) may be detected using PCR (polymerase chain reaction) on the tissue taken from the biopsy. This test is expensive and not routinely used to diagnose shingles. Do not scratch the skin where the rash is located. This may increase the risk of secondary bacterial infection and scarring. Over-the-counter (OTC) antihistamines (Benadryl) and topical creams (Lidocaine cream) can relieve the itching. After diagnosis and appropriate treatment, apply cool tap-water compresses to weeping blisters for 20 minutes several times a day to soothe and help dry the blisters. This also aids in removing the scabs and decreases the potential for bacterial infection. Tap-water compresses must be stopped once the blisters have dried, so the surrounding skin does not become too dry and itchy. Remember that weeping blisters contain the virus and are contagious to individuals who are susceptible to the chickenpox virus. Some patients with shingles can be treated appropriately by their primary care physicians, including internal medicine or family medicine specialists; initial care may be started by an emergency medicine physician. However, if there is a chance the eye may be involved, an ophthalmologist should be consulted. If a person is pregnant and gets shingles, they should consult with their ob-gyn physician immediately. For long-term or chronic pain involved in postherpetic neuralgia, a neurologist and/or pain specialists may be involved in the care of the patient. The majority of people who get shingles have signs and symptoms that last about three to five weeks. However, about 50% of those over 60 years of age who don't get treated may develop postherpetic neuralgia, a condition that can result in chronic mild to even excruciating pain. This occurs because shingles viruses can damage the nerves in the skin. Postherpetic neuralgia may last for months to years. Some doctors only treat symptoms of shingles, such as pain, when the disease is diagnosed later than 72 hours after the rash develops. Pain relievers, such as acetaminophen (Tylenol, for example), ibuprofen (Advil, for example), naproxen (Aleve), or tricyclic antidepressants are examples of some pain medications that may be used. Topical creams (for example, calamine lotion) may help reduce itching. Postherpetic neuralgia (PHN) may require additional medications such as opioids (for example, oxycodone, morphine) to control pain. PHN is the pain that remains in some people even after the rash goes away. Some patients do not respond to common pain-management therapies and may need to be referred to a pain-management specialist. Drugs usually prescribed for seizures and other nerve-related problems, gabapentin and pregabalin, have been effective in reducing pain in some patients with shingles, including those with PHN. An indication for a drug used to previously treat restless leg syndrome was approved by the FDA in 2012 to treat nerve-related pain seen in PHN. The drug is gabapentin enacarbil (Horizant), an antiepileptic, and was approved for PHN pain treatment after clinical trials showed the drug was safe and effective. PHN pain has been difficult to treat; this drug may help a significant number of shingles patients that develop PHN. Sometimes topical corticosteroids are used to decrease inflammation and pain, but they should be used only under the supervision of a health care professional since, in some patients, corticosteroids may make the infection worse. Topical medications may be used to soothe the area or prevent infection (see above, home treatments). After patients leave the doctor's office, they need to take all the medicine prescribed and follow the directions given. If people notice new symptoms or if they cannot control the pain or itching, they should contact their doctor immediately. Shingles is not contagious (able to spread) in the sense that people who are exposed to a patient with shingles will not "catch shingles." Anyone who has already had chickenpox or has received the chickenpox vaccine, and is otherwise healthy, should be protected and at no risk when around a patient with shingles. However, people who have never had chickenpox and have not received the chickenpox vaccine are susceptible to infection by a patient with shingles. These susceptible people, if exposed to the shingles virus, will not develop shingles, but they could develop chickenpox and eventually shingles if the viruses reactivate in the nerves at a later date. Consequently, people consider the condition classified as fitting into disease categories that include both infectious diseases and neurological disorders. Susceptible individuals include babies, young children, and unvaccinated individuals, so people with shingles are actually contagious for VZV infections in the form of chickenpox. Consequently, these individuals may get shingles at a later time in life, as can anyone who has had chickenpox. Covering the rash that occurs with shingles with a dressing or clothing helps decrease the risk of spreading the infection to others. Pregnant women are not unusually susceptible to shingles but if shingles develops near the end of pregnancy, the fetus may be harmed. First, the VZV vaccine, otherwise known as the chickenpox vaccine, may decrease the incidence of shingles by enhancing the immune system's ability to fight off VZV (about 70%-90% effective) or keep this virus inactive. This vaccine is usually administered to children, but the immunity may decline in about 15-20 years. The single-dose vaccine dose is given to babies 12-18 months of age. Most vaccine side effects, if they occur, are mild and range from a rash, skin redness, and swelling to small chickenpox lesions, usually at the injection site. Boosters of this vaccine for use in adults are now being investigated and may help prevent shingles in the future. Second, there is a vaccine, Zostavax, which the U.S. Centers for Disease Control and Prevention (CDC) recommends that all adults 60 years of age and older receive. Data show that the Zostavax vaccine prevents about 51% of shingles cases and about 67% of PHN so the disease is vaccine-preventable in some people. It is most effective in the 60- to 69-year-old age group; its efficacy in older patients becomes less as the age of the patient increases. The CDC suggests that the vaccine protection lasts about five years. The vaccine is not given to patients with ongoing shingles disease because it is only effective in preventing or reducing complications of the disease (PHN) before the virus is reactivated. The vaccine is composed of attenuated live chickenpox virus; people who obtain the vaccine should avoid contact with individuals who may be susceptible to viral infections, especially after just receiving the vaccine. Side effects of the vaccine are usually mild and confined to the injection site; these include erythema (skin redness), pain or tenderness of the site, swelling, and itching (in about one person in three that obtains the vaccine). Headaches occur in about one person per 70 that gets the vaccine. Vaccine contraindications include patients with a weakened immune system, AIDS, taking steroids, undergoing cancer treatments, pregnancy, or planning pregnancy (individuals planning pregnancy should wait at least four weeks after vaccination before attempting pregnancy). Varicella zoster immune globulin (VZIG or ZIG) can be used to passively prevent VSV infection, but it is used rarely and only in special cases (for example, newborns, pregnancy, immune-compromised patients). Currently, there are no data that suggest that VZIG prevents shingles. In the fall of 2018, there was a report that many individuals couldn't get the vaccine because GlaxoSmithKline (GSK, the sole producer of it) likely underestimated the demand for the vaccine. Home remedies for shingles are mainly concerned with reducing the pain caused by this disease. Cold compresses (some containing aluminum acetate), colloidal oatmeal baths, starched baths, and some topical creams may help reduce pain for some people. Loose-fitting clothing may help reduce pain as clothing that touches or rubs sensitive skin areas can be painful. Many cases of shingles go away by themselves, with or without treatment. The rash and pain should be gone in two to three weeks. However, shingles may last longer and be more likely to recur if the person is older, especially older than 50 years of age, or if they have a serious medical problem. Pain may last after the rash is gone. This is called postherpetic neuralgia (PHN). About 10%-15% of all shingles patients get PHN. The older the patient, the more likely they will develop PHN, and the pain that develops frequently is severe. PHN pain often lasts months and occasionally may go on for years. A new drug, Horizant (described above), may reduce the PHN symptoms. Other possible complications include a bacterial skin infection, spread of infection to internal organs of the body, or eye damage. Scarring is common. Lesions in the mouth make it difficult for patients to eat and drink. About 10%-25% of people with shingles develop the complication of eye involvement. This is termed herpes zoster ophthalmicus and may involve several eye structures. The disease can lead to blindness and should be considered a medical emergency. Ramsay Hunt syndrome is a variation of this infection that involves the facial nerves and results in facial paralysis, usually on one side of the face, and may also result in hearing loss. Unfortunately, individuals can get shingles more than once, so recurrence is possible. Although more than two shingles outbreaks in a lifetime is rare, they are significant because they usually occur in people with multiple medical problems or increasingly weakened immune responses. This complication of shingles often indicates that the person has increasing medical problems that need to be diagnosed or aggressively treated (or both). Shingles is almost never life threatening but may result in severe pain and blindness. Pregnant females who get shingles are not at as high a risk for viral complications as those pregnant females who become infected with chickenpox. However, if shingles develops within a few weeks of the delivery date, the infant may be at risk for viral complications, and the affected woman should notify her ob-gyn doctor immediately. In addition, shingles at any time during pregnancy may require special treatments; the ob-gyn physician needs to be contacted to help arrange individualized treatment plans. There are several effective treatments for shingles. Drugs that fight viruses (antivirals), such as acyclovir (Zovirax), valacyclovir (Valtrex), or famciclovir (Famvir), can reduce the severity and duration of the rash if started early (within 72 hours of the appearance of the rash). In addition to antiviral medications, pain medications may be needed for symptom control. Both nonsteroidal anti-inflammatory medications and narcotic pain-control medications may be used for pain management in shingles. Moon, James E. "Herpes Zoster." Medscape.com. Mar. 6, 2018. <http://emedicine.medscape.com/article/218683-overview>. United States. Centers for Disease Control and Prevention. "Shingles (Herpes Zoster)." Jan. 30, 2018. <http://www.cdc.gov/shingles/>. Griffith , RS, DC DeLong and JD Nelson. Relation of arginine-lysine antagonism to herpes simplex growth in tissue culture. 1981. Chemotherapy Journal. 21 November 2018 . USDA Food Composition Databases . L-arginine. 21 November 2018 . What kinds of treatments have been effective for your shingles? What were your shingles symptoms and signs? How was your case of shingles diagnosed?